Dmitrenko, I. 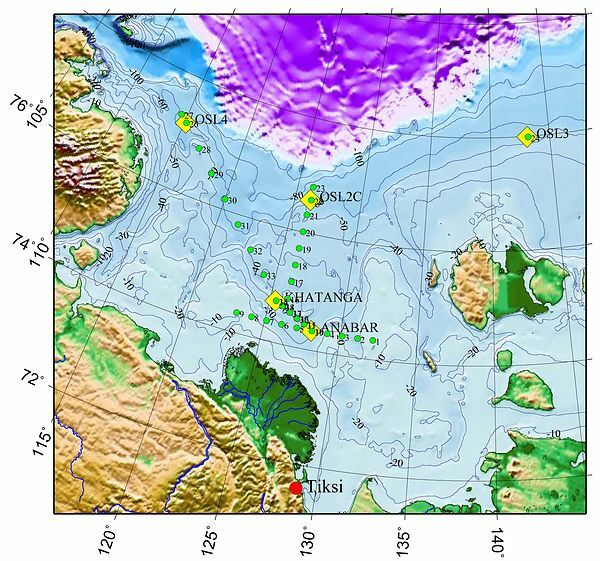 A., Kirillov, S. A., Bloshkina, E. and Lenn, Y. D. (2012) Tide-induced vertical mixing in the Laptev Sea coastal polynya. Journal of Geophysical Research: Oceans, 117 . C00G14. DOI 10.1029/2011JC006966. Dmitrenko, I. A., Kirillov, S. A., Ivanov, V. V., Rudels, B., Nuno, S. and Koldunov, N. V. (2012) Modified halocline water over the Laptev Sea continental margin : historical data analysis. Journal of Climate, 25 . pp. 5556-5565. DOI 10.1175/JCLI-D-11-00336.1. Kirillov, S. A., Dmitrenko, I. A., Ivanov, V. V., Aksenov, E. O., Makhotin, M. S. and de Quevas, B. A. (2012) The influence of atmospheric circulation on the dynamics of the intermediate water layer in the eastern part of the St. Anna Trough. Doklady Earth Sciences, 444 (1). pp. 630-633. DOI 10.1134/S1028334X12050121. Spielhagen, R. F. (2012) History of Atlantic water advection to the Arctic Ocean : a review of 20 years of progress since the “Oden”–“Polarstern” expedition ARCTIC 91. Polarforschung, 82 (1). pp. 19-36. DOI hdl:10013/epic.40431.d001. Dmitrenko, I. A., Ivanov, V. V., Kirillov, S. A., Vinogradova, E. L., Torres-Valdes, S. and Bauch, D. (2011) Properties of the Atlantic derived halocline waters over the Laptev Sea continental margin: Evidence from 2002 to 2009. Journal of Geophysical Research: Oceans, 116 (C10). C10024. DOI 10.1029/2011JC007269. Ebner, L., Schröder, D. and Heinemann, G. (2011) Impact of Laptev Sea flaw polynyas on the atmospheric boundary layer and ice production using idealized mesoscale simulations. Polar Research, 30 (7210). DOI 10.3402/polar.v30i0.7210. Ernsdorf, T., Schröder, D., Adams, S., Heinemann, G., Timmermann, R. and Danilov, S. (2011) Impact of atmospheric forcing data on simulations of the Laptev Sea polynya dynamics using the sea-ice ocean model FESOM. Journal of Geophysical Research-Oceans, 116 (C12038). DOI 10.1029/2010JC006725. Kern, S., Ozsoy-Cicek, B., Willmes, S., Nicolaus, M., Haas, C. and Ackley, S. (2011) An intercomparison between AMSR-E snow-depth and satellite C- and Ku-band radar backscatter data for Antarctic sea ice. Annals of Glaciology, 52 (57). pp. 279-290. Makhotin, M. S. and Dmitrenko, I. A. (2011) Interannual variability of Pacific summer waters in the Arctic Ocean. Doklady Earth Sciences, 438 (1). pp. 730-732. DOI 10.1134/S1028334X11050345. Polyakov, I. V., Alexeev, V. A., Ashik, I. M., Bacon, S., Beszczynska-Möller, A., Carmack, E. C., Dmitrenko, I. A., Fortier, L., Gascard, J. C., Hansen, E., Hölemann, J., Ivanov, V. V., Kikuchi, T., Kirillov, S., Lenn, Y. D., McLaughlin, F. A., Piechura, J., Repina, I., Timokhov, L. A., Walczowski, W. and Woodgate, R. (2011) Fate of early 2000s Arctic warm water pulse. Bulletin of the American Meteorological Society, 92 (5). pp. 561-566. DOI 10.1175/2010BAMS2921.1. Schröder, D., Heinemann, G. and Willmes, S. (2011) The impact of a thermodynamic sea-ice module in the COSMO numerical weather prediction model on simulations for the Laptev Sea, Siberian Arctic. Polar Research, 30 . p. 6334. DOI 10.3402/polar.v30i0.6334. Thiede, J. , Jessen, C., Knutz, P., Kuijpers, A., Mikkelsen, N., Nørgaard-Pedersen, N. and Spielhagen, R. F. (2011) Million years of Greenland Ice Sheet history recorded in ocean sediments. Polarforschung, 80 (3). pp. 141-149. Willmes, S., Adams, S., Schröder, D. and Heinemann, G. (2011) Spatio-temporal variability of polynya dynamics and ice production in the Laptev Sea between the winters of 1979/80 and 2007/08. Polar Research, 30 . p. 5971. DOI 10.3402/polar.v30i0.5971. Willmes, S., Haas, C. and Nicolaus, M. (2011) High radar-backscatter regions on Antarctic sea-ice and their relation to sea-ice and snow properties and meteorological conditions. International Journal of Remote Sensing, 32 (14). pp. 3967-3984. DOI 10.1080/01431161003801344. Jahn, A., Tremblay, L. B., Newton, R., Holland, M. M., Mysak, L. A. and Dmitrenko, I. A. (2010) A tracer study of the Arctic Ocean's liquid freshwater export variability. Journal of Geophysical Research: Oceans, 115 . C07015. DOI 10.1029/2009JC005873. Jakobsson, M., Long, A., Ingólfsson, Ó., Kjær, K. H. and Spielhagen, R. (2010) New insights on Arctic Quaternary climate variability from palaeo-records and numerical modelling. Quaternary Science Reviews, 29 (25-26). pp. 3349-3358. DOI 10.1016/j.quascirev.2010.08.016. Polyakov, I. V., Timokhov, L. A., Alexeev, V. A., Bacon, S., Dmitrenko, I. A., Fortier, L., Frolov, I. E., Gascard, J. C., Hansen, E., Ivanov, V. V., Laxon, S., Mauritzen, C., Perovich, D., Shimada, K., Simmons, H. L., Sokolov, V. T., Steele, M. and Toole, J. (2010) Arctic Ocean warming contributes to reduced polar ice cap. Journal of Physical Oceanography, 40 (12). pp. 2743-2756. DOI 10.1175/2010JPO4339.1. Willmes, S., Krumpen, T., Adams, S., Rabenstein, L., Haas, C., Hendricks, S., Heinemann, G. and Hoelemann, J. (2010) Cross-validation of polynya monitoring methods from multi-sensor satellite and airborne data: a case study from the Laptev Sea.. Canadian Journal of Remote Sensing, 36 (1:Special Issue: Remote Sensing Innovations During the International Polar Year). pp. 196-210. DOI 10.5589/m10-012. Adams, S., Spang, R., Preusse, P. and Heinemann, G. (2009) The benefit of limb cloud imaging for infrared limb sounding of tropospheric trace gases. Atmospheric Measurement Techniques, 2 (1). pp. 287-298. DOI 10.5194/amt-2-287-2009. Gusev, E. A., Andreeva, I. A., Anikina, N. Y., Bondarenko, S. A., Derevyanko, L. G., Iosifidi, A. G., Klyuvitkina, T. S., Litvinenko, I. V., Petrova, V. I., Polyakova, E. I., Popov, V. V. and Stepanova, A. Y. (2009) Stratigraphy of Late Cenozoic sediments of the western Chukchi Sea: New results from shallow drilling and seismic-reflection profiling. Global and Planetary Change, 68 (1-2). pp. 115-131. DOI 10.1016/j.gloplacha.2009.03.025. Lenn, Y. D., Wiles, P. J., Torres-Valdes, S., Abrahamsen, E. P., Rippeth, T. P., Simpson, J. H., Bacon, S., Laxon, S. W., Polyakov, I., Ivanov, V. and Kirillov, S. (2009) Vertical mixing at intermediate depths in the Arctic boundary current. Geophysical Research Letters, 36 (5). L05601. DOI 10.1029/2008GL036792. Willmes, S., Bareiss, J., Haas, C. and Nicolaus, M. (2009) Observing snowmelt dynamics on fast ice in Kongsfjorden, Svalbard, with NOAA/AVHRR data and field measurements. Polar Research, 28 (2). pp. 203-213. DOI 10.1111/j.1751-8369.2009.00095.x. Willmes, S., Haas, C., Nicolaus, M. and Bareiss, J. (2009) Satellite microwave observations of the interannual variability of snowmelt on sea ice in the Southern Ocean. Journal of Geophysical Research - Oceans, 114 (C3). pp. 114-127. DOI 10.1029/2008JC004919. Brümmer, B., Schröder, D., Müller, G., Spreen, G., Jahnke-Bornemann, A. and Launiainen, J. (2008) Impact of a Fram Strait cyclone on ice edge, drift, divergence, and concentration: Possibilities and limits of an observational analysis. Journal of Geophysical Research-Oceans, 113 (C12). DOI 10.1029/2007JC004149. Dmitrenko, I. A., Kirillov, S. A. and Tremblay, L. B. (2008) The long-term and interannual variability of summer fresh water storage over the eastern Siberian shelf: Implication for climatic change. Journal of Geophysical Research: Oceans, 113 . C03007. DOI 10.1029/2007JC004304. Dmitrenko, I. A., Kirillov, S. A., Ivanov, V. V. and Woodgate, R. A. (2008) Mesoscale Atlantic water eddy off the Laptev Sea continental slope carries the signature of upstream interaction. Journal of Geophysical Research: Oceans, 113 . C07005. DOI 10.1029/2007JC004491. Dmitrenko, I. A., Polyakov, I. V., Kirillov, S. A., Timokhov, L. A., Frolov, I. E., Sokolov, V. T., Simmons, H. L., Ivanov, V. V. and Walsh, D. (2008) Toward a warmer Arctic Ocean: Spreading of the early 21st century Atlantic Water warm anomaly along the Eurasian Basin margins. Journal of Geophysical Research: Oceans, 113 . C05023. DOI 10.1029/2007JC004158. Feister, U., Junk, J., Woldt, M., Bais, A., Helbig, A., Janouch, M., Josefsson, W., Kazantzidis, A., Lindfors, A., den Outer, P. N. and Slaper, H. (2008) Long-term solar UV radiation reconstructed by ANN modelling with emphasis on spatial characteristics of input data. Atmospheric Chemistry and Physics, 8 (12). pp. 3107-3118. DOI 10.5194/acp-8-3107-2008. Gerstner, E. M. and Heinemann, G. (2008) Real-time areal precipitation determination from radar by means of statistical objective analysis. Journal of Hydrology, 352 (3-4). pp. 296-308. DOI 10.1016/j.jhydrol.2008.01.016. Heinemann, G. (2008) Aufbruch in den sibirischen Winter – Klimamessungen in der Laptev-See. Unijournal, Zeitschrift der Universität Trier, 34 (2). pp. 58-59. Heinemann, G. (2008) The polar regions: a natural laboratory for boundary layer meteorology – a review. Meteorologische Zeitschrift, 17 (5). pp. 589-601. DOI 10.1127/0941-2948/2008/0327. Junker, R., Grigoriev, M. N. and Kaul, N. (2008) Non-contact infrared temperature measurements in dry permafrost boreholes. Journal of Geophysical Research - Solid Earth, 113 . B04102. DOI 10.1029/2007JB004946. Klyuvitkina, T. S. and Polyakova, Y. I. (2008) Aquatic palynomorphs and their application for the Late Pleistocene and Holocene paleogeography of the Laptev Sea. Novosti Paleontologii i Stratigrafii = News of Paleontology and Stratigraphy, 49 (10-11). pp. 418-422. Novichkova, E. A. and Polyakova, E. I. (2008) Hydrological changes in the White Sea during the historical period inferred from analysis of dinocysts. Doklady Earth Sciences, 423 (1). pp. 1290-1293. DOI 10.1134/S1028334X08080242. Novichkova, E. A., Polyakova, Y. I. and Bauch, H. A. (2008) Postglacial development of the White Sea inferred from aquatic palynomorph analyses (in Russian). Novosti Paleontologii i Stratigrafii = News of Paleontology and Stratigraphy, 49 (10-11). pp. 447-449. Olyunina, O. S., Polyakova, E. I. and Romanenko, F. A. (2008) Diatom assemblages from Holocene sediments of the Kola Peninsula. Doklady Earth Sciences, 423 (2). pp. 1343-1347. DOI 10.1134/S1028334X08090031. Polyakov, I. V., Alexeev, V. A., Belchansky, G. I., Dmitrenko, I. A., Ivanov, V. V., Kirillov, S. A., Korablev, A. A., Steele, M., Timokhov, L. A. and Yashayaev, I. (2008) Arctic Ocean Freshwater Changes over the Past 100 Years and Their Causes. Journal of Climate, 21 (2). pp. 364-384. DOI 10.1175/2007JCLI1748.1. Rozhkova, A. Y., Dmitrenko, I. A., Baukh, D. and Timokhov, L. A. (2008) Variations in characteristics of the barents branch of the Atlantic Water in the Nansen Basin under the influence of atmospheric circulation over the Barents Sea. Doklady Earth Sciences, 418 (1). pp. 149-154. DOI 10.1134/S1028334X08010339. Taldenkova, E., Bauch, H., Stepanova, A., Strezh, A., Dem'yankov, S. and Ovsepyan, Y. (2008) Postglacial to Holocene history of the Laptev Sea continental margin : paleoenvironmental implications of benthic assemblages. Quaternary International, 183 . pp. 40-60. DOI 10.1016/j.quaint.2007.06.031. Drüe, C. and Heinemann, G. (2007) Characteristics of intermittent turbulence in the upper stable boundary layer over Greenland. Boundary-Layer Meteorology, 124 (3). pp. 361-381. DOI 10.1007/s10546-007-9175-8. Gundelwein, A., Müller-Lupp, T., Sommerkorn, M., Haupt, E. T. K. and Pfeiffer, E. M. (2007) Carbon in tundra soils in the Lake Labaz region of arctic Siberia. European Journal of Soil Science, 58 (5). pp. 1164-1174. DOI 10.1111/j.1365-2389.2007.00908.x. Kirillov, S. (2007) Spatial variations in sea-ice formation-onset in the Laptev Sea as a Consequence of the vertical heat fluxes caused by internal waves overturning. Polarforschung, 76 (3). pp. 119-123. Novichkova, E. A. and Polyakova, E. I. (2007) Dinoflagellate cysts in the surface sediments of the White Sea. Oceanology, 47 (5). pp. 660-670. DOI 10.1134/S0001437007050086. Papadimitriou, S., Thomas, D. N., Kennedy, H., Haas, C., Kuosa, H., Krell, A. and Dieckmann, G. S. (2007) Biogeochemical composition of natural sea ice brines from the Weddell Sea during early austral summer. Limnology and Oceanography, 52 (5). pp. 1809-1823. DOI 10.4319/lo.2007.52.5.1809. Schröder, D. and Connolley, W. M. (2007) Impact of instantaneous sea ice removal in a coupled general circulation model. Geophysical Research Letters, 34 (14). L14502. DOI 10.1029/2007GL030253. Treffeisen, R., Tunved, P., Ström, J., Herber, A., Bareiss, J., Helbig, A., Stone, R. S., Hoyningen-Huene, W., Krejci, R., Stohl, A. and Neuber, R. (2007) Arctic smoke - aerosol characteristics during a record smoke event in the European Arctic and its radiative impact. Atmospheric Chemistry and Physics Discussions, 7 (11). pp. 3035-3053. DOI 10.5194/acp-7-3035-2007. Wegner, C., Frey, K. and Michel, C. (2011) A pan-Arctic Network integrating past, present and future. Eos, Transactions American Geophysical Union, 93 (13). p. 112. DOI 10.1029/2011EO130006. Willmes, S., Bareiss, J. and Haas, C. (2007) New data set of onset of annual snowmelt on Antarctic sea ice. Eos, Transactions American Geophysical Union, 88 (22). pp. 237-241. DOI 10.1029/2007EO220002. Lüpkes, C., Vihma, T., Birnbaum, G., Dierer, S., Garbrecht, T., Gryanik, V. M., Gryschka, M., Hartmann, J., Heinemann, G., Kaleschke, L., Raasch, S., Savijärvi, H., Schlünzen, K. H. and Wacker, U. (2011) Mesoscale modelling of the Arctic atmospheric boundary layer and its interaction with sea ice. In: Arctic Climate Change : the ACSYS Decade and Beyond. , ed. by Lemke, P. and Jacobi, H. W.. Atmospheric and oceanographic sciences library : ASTL, 43 . Springer, Dordrecht, The Netherlands, pp. 279-324. ISBN 978-94-007-2026-8 DOI 10.1007/978-94-007-2027-5_7. Garmanov, A. L., Koltyshev, A. E., Nikiforov, E. G. and Timokhov, L. A. (2008) The upper mixed water layer in the Arctic Basin (in Russian). In: Raspresnennye vody i presnyy rezerv Severnogo Ledovitogo okeana (Freshened waters and freshwater reserve of the Arctic Ocean, in Russian). . Trudy AANII (Proceedings of AARI), 448 . Arkticheskiy i Antarkticheskiy Nauchno-Issledovatel'skiy Institut (Arctic and Antarctic Research Institute), St. Peterburg, Rossiya, pp. 149-189. Ipatov, A. Y., Kulakov, I. Y. and Timokhov, L. A. (2008) Surface circulation of water and ice (in Russian). In: Raspresnennye vody i presnyy rezerv Severnogo Ledovitogo okeana (Freshened waters and freshwater reserve of the Arctic Ocean, in Russian). . Trudy AANII (Proceedings of AARI), 448 . Arkticheskiy i Antarkticheskiy Nauchno-Issledovatel'skiy Institut (Arctic and Antarctic Research Institute), St. Peterburg, Rossiya, pp. 259-266. Kirillov, S. A., Timokhov, L. A., Dmitrenko, I. A. and Polyakov, I. V. (2008) Thermohaline intrusions in the northern Laptev Sea (in Russian). In: Raspresnennye vody i presnyy rezerv Severnogo Ledovitogo okeana (Freshened waters and freshwater reserve of the Arctic Ocean, in Russian). . Trudy AANII (Proceedings of AARI), 448 . Arkticheskiy i Antarkticheskiy Nauchno-Issledovatel'skiy Institut (Arctic and Antarctic Research Institute), St. Peterburg, Rossiya, pp. 205-216. Klyuvitkina, T. S. and Polyakova, Y. I. (2008) Analysis of aquatic palynomorphs and its application for the Late Pleistocene and Holocene paleoceanography of the Arctic seas (Laptev Sea as an example) (in Russian). In: Problems of Pleistocene Paleogeography and Stratigraphy (in Russian). , ed. by Bolikhovskaya, N. S. and Kaplin, P. A.. Geographical Faculty of Moscow State University, Moscow, Russia, pp. 224-244. Kochetov, S. V., Sokolova, V. E. and Timokhov, L. A. (2008) Transport of freshened waters and ice from the Siberian shelf seas into the Arctic Basin (in Russian). In: Raspresnennye vody i presnyy rezerv Severnogo Ledovitogo okeana (Freshened waters and freshwater reserve of the Arctic Ocean, in Russian). . Trudy AANII (Proceedings of AARI), 448 . Arkticheskiy i Antarkticheskiy Nauchno-Issledovatel'skiy Institut (Arctic and Antarctic Research Institute), St. Peterburg, Rossiya, pp. 92-102. Kochetov, S. V., Timokhov, L. A., Ivanov, V. V. and Bryazgin, N. N. (2008) Freshwater balance of the Arctic seas (in Russian). In: Raspresnennye vody i presnyy rezerv Severnogo Ledovitogo okeana (Freshened waters and freshwater reserve of the Arctic Ocean, in Russian). . Trudy AANII (Proceedings of AARI), 448 . Arkticheskiy i Antarkticheskiy Nauchno-Issledovatel'skiy Institut (Arctic and Antarctic Research Institute), St. Peterburg, Rossiya, pp. 59-91. Koltyshev, A. E., Nikiforov, E. G. and TImokhov, L. A. (2008) Freshening of the active water layer of the Arctic Basin and the deep-water part of the Arctic marginal seas (in Russian). In: Raspresnennye vody i presnyy rezerv Severnogo Ledovitogo okeana (Freshened waters and freshwater reserve of the Arctic Ocean, in Russian). . Trudy AANII (Proceedings of AARI), 448 . Arkticheskiy i Antarkticheskiy Nauchno-Issledovatel'skiy Institut (Arctic and Antarctic Research Institute), St. Peterburg, Rossiya, pp. 18-28. Koltyshev, A. E., Nikiforov, E. G., TImokhov, L. A. and Garmanov, A. L. (2008) Large-scale changes in the distribution of freshened waters in the Arctic Basin (in Russian). In: Raspresnennye vody i presnyy rezerv Severnogo Ledovitogo okeana (Freshened waters and freshwater reserve of the Arctic Ocean, in Russian). . Trudy AANII (Proceedings of AARI), 448 . Arkticheskiy i Antarkticheskiy Nauchno-Issledovatel'skiy Institut (Arctic and Antarctic Research Institute), St. Peterburg, Rossiya, pp. 37-58. Lebedev, N. V., Karpiy, V. Y., Pokrovsky, O. M., Sokolov, V. T. and Timokhov, L. A. (2008) Special database on temperature and salinity of the waters of the Arctic Basin and the adjoining Arctic seas in winter (in Russian). In: Raspresnennye vody i presnyy rezerv Severnogo Ledovitogo okeana (Freshened waters and freshwater reserve of the Arctic Ocean, in Russian). . Trudy AANII (Proceedings of AARI), 448 . Arkticheskiy i Antarkticheskiy Nauchno-Issledovatel'skiy Institut (Arctic and Antarctic Research Institute), St. Peterburg, Rossiya, pp. 5-17. Lebedev, N. V., Timokhov, L. A. and Nitishinsky, M. A. (2008) A model of vertical profiles (estimation of the thickness of the upper mixed water layer according to observation data from standard depths) (in Russian). In: Raspresnennye vody i presnyy rezerv Severnogo Ledovitogo okeana (Freshened waters and freshwater reserve of the Arctic Ocean, in Russian). . Trudy AANII (Proceedings of AARI), 448 . Arkticheskiy i Antarkticheskiy Nauchno-Issledovatel'skiy Institut (Arctic and Antarctic Research Institute), St. Peterburg, Rossiya, pp. 242-247. Nikiforov, E. G., Timokhov, L. A., Koltyshev, A. E. and Sokolov, V. T. (2008) Major salinity anomalies and the dynamics of the freshwater reservoir of the Arctic Basin in winter (in Russian). In: Raspresnennye vody i presnyy rezerv Severnogo Ledovitogo okeana (Freshened waters and freshwater reserve of the Arctic Ocean, in Russian). . Trudy AANII (Proceedings of AARI), 448 . Arkticheskiy i Antarkticheskiy Nauchno-Issledovatel'skiy Institut (Arctic and Antarctic Research Institute), St. Peterburg, Rossiya, pp. 29-36. Nemirovskaya, I. (2007) Study of hydrocarbons in bottom sediments of the northern Dvina River-White Sea geochemical barrier during spring flood. In: Proceedings of the Thirtieth Arctic and Marine Oilspill Program (AMOP) Technical Seminar : June 5-7, 2007, Edmonton (Alberta) Canada = Compte rendu du trentieme Colloque technique du Programme de lutte contre les deversements d'hydrocarbures en mer et dans l'Arctique (AMOP) : 5-7 juin, 2007, Edmonton (Alberta) Canada. ; 2 . Environment Canada, Ottawa, Canada, pp. 911-924. Overduin, P. P., Grigoriev, M. N., Junker, R., Rachold, V., Kunitsky, V. V., Bolshiyanov, D. Y. and Schirrmeister, L. (2007) Russian-German cooperation SYSTEM LAPTEV SEA: The expedition COAST I: COAST drilling campaign 2005 : Subsea permafrost studies in the near-shore zone of the Laptev Sea. In: Expeditions in Siberia in 2005. , ed. by Schirrmeister, L.. Berichte zur Polar- und Meeresforschung = Reports on Polar and Marine Research, 550 . AWI, Bremerhaven, pp. 1-39. Schirrmeister, L., Wagner, D., Grigoriev, M. N. and Bolshiyanov, D. Y. (2007) The expedition LENA 2005. In: Expeditions in Siberia in 2005. , ed. by Schirrmeister, L.. Berichte zur Polar- und Meeresforschung = Reports on Polar and Marine Research, 550 . AWI, Bremerhaven, pp. 41-242. Stepanova, A. Y., Taldenkova, E. E. and Baukh, K. A. (2007) Skorost′ smeny soobshchestv ostrakod na shel′fe morya Laptevykh v khode poslelednikovyouy transgressi morya (The rate of ostracodal assemblage replacement on the Laptev Sea shelf during the postglacial transgression, in Russian). In: Evstaticheskie kolebaniya uroviya morja v Fanerozoe i reakciya na nikh morskoy byoti : materialy soobshchaniya, Moskva, 13.11.2007 g. (Proceedings of the Conference Eustatic Sea-Level Oscillations During the Phanerozoic and Their Influence on Biota, Moskcow, 13.11.2007, in Russian). . Paleontologicheskiy Institut RAN, Moskva, Rossiya, pp. 71-82. Adams, S., Schröder, D., Willmes, S. and Heinemann, G. (2012) Retrieval of thin ice thickness distribution and ice production within the Laptev Sea Polynya using a combined remote sensing. [Talk] In: AGU Fall Meeting 2012. , 03.12.-07.12.2012, San Francisco, USA . Adams, S., Schröder, D., Willmes, S., Heinemann, G. and Krumpen, T. (2012) Daily thin-ice thickness maps from MODIS thermal infrared imagery. [Other] In: IEEE International Geoscience and Remote Sensing Symposium IGARSS. , 22.07.-27.07.2012, München . Adams, S., Willmes, S., Schröder, D., Heinemann, G., Bauer, M. and Krumpen, T. (2012) Improvement and sensitivity analysis of thermal thin-ice thickness retrievals. [Other] In: 10. Workshop on Russian-German Cooperation: Laptev Sea System. , 17.12.-20.12.2012, Kiel . Antonova, S., Krumpen, T. and Gerdes, R. (2012) Spatial and temporal variability of landfast ice in the Laptev Sea. [Other] In: 10. Workshop on Russian-German Cooperation: Laptev Sea System. , 17.12.-20.12.2012, Kiel . Bauch, D. (2012) Overview lecture on Session II: Geochemical and sedimentological tracers from the Laptev Sea. [Talk] In: 10. Workshop on Russian-German Cooperation: Laptev Sea System. , 17.12.-20.12.2012, Kiel . Chistyakova, N. O., Taldenkova, E. E., Ovsepyan, Y. S. and Spielhagen, R. F. (2012) Postglacial environmental changes at the eastern Laptev Sea continental margin inferred from benthic and planktic foraminiferal assemblages. [Other] In: Joint Conference Geomorphology and Paleogeography of Polar Regions, Symposium Leopoldina and INQUA Peribaltic Working Group Workshop. , 09.09.-17.09.2012, St. Petersburg, Russia . Ebner, L., Schröder, D., Heinemann, G., Adams, S., Willmes, S., Bauer, M. and Timmermann, R. (2012) Coupled and stand-alone high resolution simulations of polynya dynamics and physical processes in the Laptev Sea using the sea-ice- ocean model FESOM and the atmosphere NWP model COSMO. [Other] In: 10. Workshop on Russian-German Cooperation: Laptev Sea System. , 17.12.-20.12.2012, Kiel . Ebner, L., Schröder, D., Heinemann, G., Adams, S., Willmes, S., Bauer, M. and Timmermann, R. (2012) Coupled and stand-alone high resolution simulations of polynya dynamics and physical processes in the Laptev Sea using the sea-ice- ocean model FESOM and the atmosphere NWP model COSMO. [Other] In: International Polar Year (IPY) Conference "From Knowledge to Action". , 22.04.-27.04.2012, Montréal, Canada . Ernsdorf, T., Heinemann, G. and Drüe, C. (2012) Aircraft-based investigation of boundary layer structures over the North Water Polynya and in summertime katabatic winds over northwest Greenland. [Talk] In: International Polar Year (IPY) Conference "From Knowledge to Action". , 22.04.-27.04.2012, Montréal, Canada . Haid, V., Timmermann, R., Ebner, L. and Heinemann, G. (2012) Impact of coastal polynyas on sea ice production and water mass modification in the southwestern Weddell Sea. [Other] In: EGU General Assembly 2012. , 22.04.-27.04.2012, Vienna, Austria . Heinemann, G. (2012) Overview lecture on Session IV: Remote sensing and modelling of sea-ice and ocean dynamics in the Laptev Sea . [Talk] In: 10. Workshop on Russian-German Cooperation: Laptev Sea System. , 17.12.-20.12.2012, Kiel . Heinemann, G. and Ebner, L. (2012) Cyclone and mesocyclone tracking in the Antarctic region and southern polar ocean. [Talk] In: European Polar Low Working Group Oslo Polar Low Workshop. , 21.05.-22.05.2012, Oslo, Norway . Heinemann, G. and Preußer , A. (2012) A study of the dynamics of the North Water Polynya using different satellite data sets and models. [Talk] In: ArcticNet 8. Annual Scientific Meeting, ASM2012. , 10.12.-14.12.2012, Vancouver, BC, Canada . Heinemann, G., Bauer, M., Ebner, L., Schröder, D., Willmes, S. and Adams, S. (2012) Dynamical downscaling for the Laptev Sea region of the Siberian Arctic and impacts on sea ice production in flaw polynyas. [Talk] In: ADSIMNOR-CORDEX Workshop on Arctic Climate Modeling Results and Needs. , 20.03.-21.03.2012, Norrköping, Sweden . Hölemann, J. A. (2012) Overview lecture on Session I: Ocean/sea-ice/atmosphere observations in and around the Laptev Sea Polynya. [Invited talk] In: 10. Workshop on Russian-German Cooperation: Laptev Sea System. , 17.12.-20.12.2012, Kiel . Hölemann, J., Heim, B., Novikhin, A., Loginova, A. , Martynov, F., Janout, M. and Koch, B. (2012) Colored dissolved organic matter (CDOM) in the Laptev Sea: distribution and potential impacts. [Talk] In: 10. Workshop on Russian-German Cooperation: Laptev Sea System. , 17.12.-20.12.2012, Kiel . Janout, M., Hölemann, J. and Krumpen, T. (2012) Recent observations of warm and saline under-ice cross-shore transport on the Laptev Sea shelf. [Talk] In: TOS/ASLO/AGU 2012 Ocean Sciences Meeting. , 19.02.-24.02.2012, Salt Lake City, USA . Juhls, B., Wegner, C., Hölemann, J. A. and Heim, B. (2012) Observation of wind-induced resuspension events in the Laptev Sea by remote-sensing and field-data. [Talk] In: 10. Workshop on Russian-German Cooperation: Laptev Sea System. , 17.12.-20.12.2012, Kiel . Kohnemann, S., Heinemann, G., Schröder, D., Willmes, S. and Köberle, C. (2012) Investigation of regional sea ice budgets in the Arctic: sea ice/ocean model NAOSIM compared with different CMIPS global climate models. [Talk] In: 10. Workshop on Russian-German Cooperation: Laptev Sea System. , 17.12.-20.12.2012, Kiel . Krumpen, T., Janout, M., Hodges, K. I., Gerdes, R., Girard-Ardhuin, F., Hölemann, J. A. and Willmes, S. (2012) Variability and trends in Laptev Sea ice outflow between 1992-2011. [Invited talk] In: 10. Workshop on Russian-German Cooperation: Laptev Sea System. , 17.12.-20.12.2012, Kiel . Kulakov, M., Makshtas, A., Shutilin, S. and Heinemann, G. (2012) Application of a coupled sea ice-ocean model to investigations of polynyas in the Arctic shelf seas. [Other] In: International Polar Year (IPY) Conference "From Knowledge to Action". , 22.04.-27.04.2012, Montréal, Canada . Novikhin, A., Namyatov, A., Hölemann, J. A., Morozova, O., Bloshkina, E. and Bauch, D. (2012) The main results of hydrochemical studies in the Laptev Sea in 2007-2012. [Talk] In: 10. Workshop on Russian-German Cooperation: Laptev Sea System. , 17.12.-20.12.2012, Kiel . Schröder, D., Adams, S., Heinemann, G. and Timmermann, R. (2012) A combined remote sensing -sea ice model approach to derive thin ice thicknesses within the Laptev Sea polynyas continously for the winters 2007/08 and 2008/09. [Talk] In: 10. Workshop on Russian-German Cooperation: Laptev Sea System. , 17.12.-20.12.2012, Kiel . Selyuzhenok, V., Krumpen, T. and Gerdes, R. (2012) Mapping Laptev Sea landfast ice extent using AMSR-E passive microwave imagery. [Talk] In: 10. Workshop on Russian-German Cooperation: Laptev Sea System. , 17.12.-20.12.2012, Kiel . Semeryuk, I. and Bauch, D. (2012) Distribution of sea ice derived brine signals from the Siberian shelf areas based on stable oxygen isotope and salinity data. [Talk] In: Joint Conference "Geomorphology and Paleogeography of Polar Regions, Leopoldina Symposium on Russian-German Cooperation in the Scientific Exploration of Northern Eurasia and the Adjacent Arctic Ocean and INQUA Peribaltic Working Group Workshop. , 09.09.-17.09.2012, St. Petersburg, Russia . Spielhagen, R., Nørgaard-Pedersen, N. and Vehlow, A. (2012) Arctic Ocean iceberg drift patterns and paleoenvironmental change in the last 50 kyr reconstructed from an Alpha Ridge to Gakkel Ridge transect. [Talk] In: APEX IV, Arctic Palaeoclimate and its Extremes, International Conference and Workshop. , 15.05.-18.05.2012, Oulanka, Finland . APEX VI, Palaeoclimate and its Extremes : international conference and workshop, Oulanka, Finland, 15-18 May 2012. ; p. 87 . Spielhagen, R., Werner, K., Chistyakova, N. and Taldenkova, E. (2012) Holocene variability of Atlantic water advection to the Arctic Ocean. [Other] In: Joint Conference "Geomorphology and Paleogeography of Polar Regions, Leopoldina Symposium on Russian-German Cooperation in the Scientific Exploration of Northern Eurasia and the Adjacent Arctic Ocean and INQUA Peribaltic Working Group Workshop. , 09.09.-17.09.2012, St. Petersburg, Russia . Taldenkova, E., Chistyakova, N., Ovsepyan, Y., Stepanova, A., Bauch, H. A. and Spielhagen, R. F. (2012) Water mass changes and environmental transformation of the Laptev Sea continental margin since last deglacial times. [Talk] In: 10. Workshop on Russian-German Cooperation: Laptev Sea System. , 17.12.-20.12.2012, Kiel . Taldenkova, E., Christyakova, N., Bauch, H. A., Stepanova, A., Ovsepyan, Y. and Spielhagen, R. F. (2012) Past environmental transformation of the Laptev Sea continental margin and water mass changes since last deglacial times. [Talk] In: Joint Conference "Geomorphology and Paleogeography of Polar Regions, Leopoldina Symposium on Russian-German Cooperation in the Scientific Exploration of Northern Eurasia and the Adjacent Arctic Ocean and INQUA Peribaltic Working Group Workshop. , 09.09.-17.09.2012, St. Petersburg, Russia . Wegner, C. (2012) Overview lecture on Session III: Ecological importance of frontal zones and polynyas in the Laptev Sea. [Talk] In: 10. Workshop on Russian-German Cooperation: Laptev Sea System. , 17.12.-20.12.2012, Kiel . Willmes, S. and Heinemann, G. (2012) Structure and dynamics of Arctic sea -ice leads from MODIS data. [Other] In: ESA Conference on Earth Observation and Cryospheric Science. , 13.11.-16.11.2012, Frascati, Italy . Willmes, S., Adams, S., Schröder, D., Bauer, M. and Heinemann, G. (2012) Ice production in the Laptev Sea: leads vs. polynyas. [Talk] In: 10. Workshop on Russian-German Cooperation: Laptev Sea System. , 17.12.-20.12.2012, Kiel . Willmes, S., Adams, S., Schröder, D., Bauer, M. and Heinemann, G. (2012) Seasonal ice production within polynyas of the Laptev Sea. [Other] In: International Polar Year (IPY) Conference "From Knowledge to Action". , 22.04.-27.04.2012, Montréal, Canada . Willmes, S., Nicolaus, M. and Haas, C. (2012) The 19 to 89 GHz emissivity response of snow on sea ice to early melt processes: a model study of hemispheric contrasts. [Other] In: IEEE International Geoscience and Remote Sensing Symposium IGARSS. , 22.07.-27.07.2012, München . Adams, S., Schröder, D., Willmes, S., Heinemann, G., Krumpen, T. and Hölemann, J. (2011) Improvement and verification of thin ice retrieval within the Laptev Sea polynya. [Other] In: Seminar at the Center for Marine Atmospheric Sciences, ZMAW. , 18.01.2011, Hamburg . Bauer, M., Schröder, D., Heinemann, G. and Willmes, S. (2011) Daily COSMO NWP simulatios for the winters 2007/08 and 2008/09 and ice production estimations of Laptev Sea polynyas. [Other] In: COSMO/CLM User Seminar. , 28.02.-04.03.2011, Langen . Cronin, T. M., Dwyer, G. S., Briggs, W. M. J., Farmer, J., Bauch, H. A., Jakobsson, M., Spielhagen, R. F. and Stepanova, A. (2011) Arctic Ocean Temperature History since 60 ka based on ostracode Mg/Ca ratios. [Talk] In: APEX Fifth International Conference and Workshop: Quaternary Glacial and Climate Extremes. , 01.06.-04.06. 2011, Longyearbyen, Svalbard, Norway . APEX Fifth International Conference and Workshop: Quaternary Glacial and Climate Extremes / hosted by The University Centre in Svalbard (UNIS). ; pp. 57-58 . Ebner, L., Heinemann, G., Haid, V. and Timmermann, R. (2011) Mesoscale modeling in the Weddell Sea using a region NWP model and a global sea ice-ocean model. [Other] In: EGU General Assembly 2011. , 03.04.-08.04.2011, Vienna, Austria . DOI 10.3402/polar.v30i0.7210. Ebner, L., Heinemann, G., Haid, V. and Timmermann, R. (2011) Implementation of the NWP model COSMO for the Wedell Sea region in the Antarctic. [Other] In: COSMO/CLM User Seminar. , 28.02.-04.03.2011, Langen . DOI 10.3402/polar.v30i0.7210. Haid, V., Timmermann, R., Ebner, L. and Heinemann, G. (2011) Coastal polynyas in the southwestern Weddell Sea: ice production and bottom water formation. [Other] In: EGU General Assembly 2011. , 03.04.-08.04.2011, Vienna, Austria . DOI 10.3402/polar.v30i0.7210. Heim, B., Overduin, P., Lantuit, H., Günther, F., Hölemann, J., Doerffer, R., Wegner, C. and Loginova, A. (2011) OCOC – From Ocean Colour to Organic Carbon – a contribution to ESA CoastColour. [Talk] In: 3. CoastColour User Consultation Meeting. , 19.10.-20.10.2011, Lisbon, Portugal . Heinemann, G., Schröder, D., Ebner, L., Bauer, M., Adams, S. and Willmes, S. (2011) COSMO simulations of air-sea-ocean-interaction processes and impacts on polynya formationand sea ice production. [Other] In: 9. International SRNWP Workshop on Non-Hydrostatic Modelling. , 16.05.-18.05.2011, Bad Orb . Hölemann, J. and Members of the Russian-German Research Project Laptev Sea System (2011) What happens far out in the Laptev Sea while I celebrate Christmas? Answers from automated ocean observing systems and satellites. [Talk] In: Lebende Ausstellung: Brennpunkte der deutsch-russischen Zusammenarbeit auf dem Gebiet der Meeres- und Polarforschung. , 27.10.2011, St. Petersburg, Russia . Janout, M. (2011) Under-ice currents in the Laptev Sea - baroclinic tides and stratification with implications for vertical mixing. [Talk] In: Polar Marine Sciences, GRS, Gordon-Kenan Research Seminar, Contributing to the Understanding of Complex Polar Marine Systems. , 20.03.-25.03.2011, Ventura, California, USA . Krumpen, T., Köberle, C., Hendricks, S., Rabenstein, L., Willmes, S. and Gerdes, R. (2011) Investigation of sea-ice formation on Arctic shelf by means of helicopter-borne ice-thickness measurements and different satellites. [Other] In: Internatiional Union of Geodesy and Geophysics, IUGG, General Assembly. , 28.06.-07.07.2011, Melbourne, Australia . Spielhagen, R. F. (2011) History of Atlantic water advection to the Arctic in the last 15 million years . [Talk] In: 20 Year North Pole Anniversary Symposium. , 07.09.2011, Kiel . Spielhagen, R. F. and Bauch, H. A. (2011) Contrasting interglacials in the Arctic Ocean – an Eemian-Late Holocene comparison based on stable oxygen and carbon isotopes . [Talk] In: APEX Fifth International Conference and Workshop: Quaternary Glacial and Climate Extremes. , 01.06.-04.06. 2011, Longyearbyen, Svalbard, Norway . APEX Fifth International Conference and Workshop: Quaternary Glacial and Climate Extremes / hosted by The University Centre in Svalbard (UNIS). ; p. 62 . Wegner, C., Forest, A., Forwick, M., Frey, K. E., Mathis, J., Michel, C., Nikolopoulos, A., O'Regan, M. and Reigstadt, M. (2011) The Arctic in Rapid Transition (ART) Initiative: Integrating priorities for Arctic Marine Science over the next decade. [Talk] In: APEX Fifth International Conference and Workshop: Quaternary Glacial and Climate Extremes. , 01.06.-04.06. 2011, Longyearbyen, Svalbard, Norway . APEX Fifth International Conference and Workshop: Quaternary Glacial and Climate Extremes / hosted by The University Centre in Svalbard (UNIS). ; p. 63 . Werner, K. and Spielhagen, R. F. (2011) Holocene variability of surface and subsurface Atlantic Water inflow on the West Spitsbergen continental margin. [Talk] In: APEX Fifth International Conference and Workshop: Quaternary Glacial and Climate Extremes. , 01.06.-04.06. 2011, Longyearbyen, Svalbard, Norway . APEX Fifth International Conference and Workshop: Quaternary Glacial and Climate Extremes / hosted by The University Centre in Svalbard (UNIS). ; p. 65 . Adams, S., Willmes, S., Krumpen, T., Hoelemann, J. A. and Heinemann, G. (2010) Thin ice thickness retrieval within the Laptev Sea Polynya from high-resolution ice surface temperature. [Talk] In: Workshop Monitoring Arctic and Antarctic Sea Ice from Various Satellite Products. , 15.03.-19.03.2010, Bern, Switzerland . Adams, S., Willmes, S., Krumpen, T., Hölemann, J. A. and Heinemann, G. (2010) Bestimmung von Dünneisdicken in der Laptev See Polynja aus hochaufgelösten Eisoberflächentemperaturen. [Talk] In: DACH 2010 Meteorologentagung. , 20.09.-24.09.2010, Bonn . Ebner, L., Bauer, M. and Heinemann, G. (2010) Detektion von Mesozyklen in der Antarktis. [Other] In: DACH 2010 Meteorologentagung. , 20.09.-24.09.2010, Bonn . Ebner, L., Schröder, D. and Heinemann, G. (2010) Impact of Laptev Sea flaw polynyas on the atmospheric boundary layer and ice production using idealized mesoscale simulations. [Other] In: EGU General Assembly 2010. , 02.05.-07.05.2010, Vienna, Austria . DOI 10.3402/polar.v30i0.7210. Ebner, L., Schröder, D. and Heinemann, G. (2010) Impact of Laptev Sea flaw polynyas on the atmospheric boundary layer and ice production using idealized mesoscale simulations. [Other] In: Joint Russian-German Workshop on Research in the Laptev Sea Region. , 08.11.-11.11.2010, St. Petersburg, Russia . DOI 10.3402/polar.v30i0.7210. Ebner, L., Schröder, D. and Heinemann, G. (2010) Impact of Laptev Sea flaw polynyas on the atmospheric boundary layer and ice production using idealized mesoscale simulations. [Other] In: COSMO/CLM User Seminar. , 02.03.-04.03.2010, Langen . DOI 10.3402/polar.v30i0.7210. Ernsdorf, T. and Heinemann, G. (2010) Experimental study of the interaction of katabatic winds with polynyas/sea ice near Greenland during summer (IKAPOS). [Other] In: International Research Day. , 03.12.2010, Trier . Friedrich, A., Heinemann, G. and Willmes, S. (2010) Investigation of polynya dynamics in the Weddell Sea region using remote sensing data. [Other] In: 24. Internationale Polartagung. , 06.09.-10.09.2010, Obergurgl, Austria . Haid, V. and Timmermann, R. (2010) Simulation of coastal polynyas in the western Weddell Sea. [Other] In: EGU General Assembly 2010. , 02.05.-07.05.2010, Vienna, Austria . Haid, V., Timmermann, R., Heinemann, G. and Ebner, L. (2010) Simulation of coastal polynyas and associated ocean processes in the western Weddell Sea. [Talk] In: 24. Internationale Polartagung. , 10.09.2010, Obergurgl, Austria . Heinemann, G. (2010) Coole Grenzschichten: Wirkung und Auswirkung von Helmut Kraus auf die Polarforschung : wissenschaftlicher Festvortrag. [Invited talk] In: Universität Bonn. , 2010, Bonn . Heinemann, G., Schröder, D., Willmes, S., Ebner, L., Adams, S., Ernsdorf, T., Helbig, A. and Timmermann, R. (2010) Air-sea-ocean interaction processes and impacts on polynya formation and sea ice production in the Laptev Sea of the Siberian Arctic. [Other] In: EGU General Assembly 2010. , 02.05.-07.05.2010, Vienna, Austria . Heinemann, G., Schröder, D., Willmes, S., Ebner, L., Adams, S., Ernsdorf, T., Helbig, A. and Timmermann, R. (2010) Air-sea-ocean interaction processes and impacts on polynya formation and sea ice production in the Laptev Sea of the Siberian Arctic. [Other] In: Joint Russian-German Workshop on Research in the Laptev Sea Region. , 08.11.-11.11.2010, St. Petersburg, Russia . Heinemann, G., Timmermann, R., Ebner, L. and Haid, V. (2010) Ice-ocean-atmosphere interactions in the western Weddell Sea: high-resolution simulations using COSMO and FESOM. [Other] In: 24. Internationale Polartagung. , 06.09.-10.09.2010, Obergurgl, Austria . Hölemann, J. A. and Kirillov, S. and Members of the Laptev Sea System Project (2010) Interannual and annual variability of sea-ice formation in the Laptev Sea since 2006. [Talk] In: Glaciers and Sea Ice in Global Climate and Environmental Change Studies. , 11.11.-12.11.2010, St. Petersburg, Russia . Schröder, D., Heinemann, G. and Willmes, S. (2010) Verification of simulated sea ice surface temperature in COSMO. [Other] In: COSMO/CLM User Seminar. , 02.03.-04.03.2010, Langen . Schröder, D., Willmes, S., Adams, S., Heinemann, G. and Timmermann, R. (2010) Simulation von Dünneisdickenin den Laptev-See-Polynjen mit dem Ozean-Meereismodell FESOM. [Other] In: DACH 2010 Meteorologentagung. , 20.09.-24.09.2010, Bonn . Willmes, S., Adams, S., Schröder, D. and Heinemann, G. (2010) Longterm variability of polynya dynamics and ice production in the Laptev Sea between winters of 1979/80 and 2007/08. [Other] In: Joint Russian-German Workshop on Research in the Laptev Sea Region. , 08.11.-11.11.2010, St. Petersburg, Russia . Willmes, S., Haas, C. and Nicolaus, M. (2010) Hemisphärische Unterschiede im Verlauf der Schneeschmelze auf Meereis: eine Analyse kombinierter Modell- und Fernerkundungsstudien. [Talk] In: 24. Internationale Polartagung. , 06.09.-10.09.2010, Obergurgl, Austria . 24. Internationale Polartagung der Deutschen Gesellschaft für Polarforschung, Obergurgl, 6. bis 10. September 2010 : Programm und Zusammenfassung der Tagungsbeiträge. ; p. 64 . Terra Nostra, 2010 (5). Willmes, S., Nicolaus, M. and Haas, C. (2010) Hemispheric contrasts in the seasonal evolution of snowmelt on sea ice as identified from model data and satellite observations. [Other] In: International Symposium on Sea Ice in the Physical and Biogeochemical System. , 31.05.-04.06.2010, Tromsø, Norway . Schörder, D., Ebner, L., Heinemann, G., Timmermann, R., Stadler, J. and Ernsdorf, T. (2009) Impact of Laptev Sea flaw polynyas on the atmospheric boundary layer and sea ice formation. [Other] In: EGU General Assembly 2009. , 19.04.-24.04, Vienna, Austria . Timokhov, L. A., Ashik, I., Danilov, A., Dmitrenko, I., Hoelemann, J. A., Ivanov, V. V., Kirillov, S., Novikhin, A., Polyakov, I. V. and Sokolov, V. (2009) Summer 2007 and 2008: the temperature and salinity anomalies in the Arctic Ocean and the affecting factors (sources?). [Talk] In: S4D-NABOS-DAMOCLES Workshop on Near-Slope Observations in the Arctic Ocean. , 06.03.-07.03.2009, Paris, France . Dmitrenko, I., Polaykov, I. V., Kirillov, S. A., Timokhov, L. A., Frolov, I. E., Sokolov, H. L., Simmons, H. L., Ivanov, V. V. and Walsh, D. (2007) Towards a warmer Arctic Ocean: Spreading of the early 21st century Atlantic water warmer anomaly along the Eurasian Basin margins. [Talk] In: IUGG XXIV General Assembly "Earth, Our Changing Planet". , 02.07.-13.07.2007, Perugia, Italy . Adams, S., Willmes, S., Schröder, D. and Heinemann, G. (2012) The observation of the thin-ice thickness distribution within the Laptev Sea polynya using MODIS data. [Poster] In: ESA Conference on Earth Observation and Cryospheric Science. , 13.11.-16.11.2012, Frascati, Italy . Adams, S., Willmes, S., Schröder, D. and Heinemann, G. (2012) Extensive sensitivity analysis of MODIS thermal thin ice thicknesses and retrieval of a daily thin-ice product for the Laptev Sea. [Poster] In: International Polar Year (IPY) Conference "From Knowledge to Action". , 22.04.-27.04.2012, Montréal, Canada . Bauer, M., Schröder, D., Willmes, S., Ebner, L. and Heinemann, G. (2012) Polynya ice production of the Laptev Sea area for the winters 2007/08 and 2008/09 calculated from simulations with COSMO numerical weather prediction (NWP) model. [Poster] In: International Polar Year (IPY) Conference "From Knowledge to Action". , 22.04.-27.04.2012, Montréal, Canada . Chistyakova, N., Taldenkova, E., Ovsepyan, Y. and Spielhagen, R. (2012) Postglacial environmental changes at the eastern Laptev Sea continental margin: evidence from benthic and planktic foraminiferal assemblages . [Poster] In: APEX IV, Arctic Palaeoclimate and its Extremes, International Conference and Workshop. , 15.05.-18.05.2012, Oulanka, Finland . APEX VI, Palaeoclimate and its Extremes : international conference and workshop, Oulanka, Finland, 15-18 May 2012. ; p. 44 . Haid, V., Timmermann, R., Heinemann, G. and Ebner, L. (2012) Dense shelf water formation at coastal polynyas in the Weddell Sea. [Poster] In: SCAR and Open Science Conference "Antarctic Perspectives - Connecting the Arts to Science". , 16.07.-19.07.2012, Portland, Oregeon, USA . Heinemann, G., Bauer, M., Ebner, L. and Willmes, S. (2012) Impacts of Arctic flaw polynyas on sea ice production and the atmosperic boundary layer. [Poster] In: AGU Fall Meeting 2012. , 03.12.-07.12.2012, San Francisco, California, USA . Heinemann, G., Ebner, L., Timmermann, R. and Haid, V. (2012) Polynya formation and air/sea-ice/ocean interaction in the Weddell Sea region. [Poster] In: SCAR and Open Science Conference "Antarctic Perspectives - Connecting the Arts to Science". , 16.07.-19.07.2012, Portland, Oregeon, USA . Hölemann, J., Heim, B., Novikhin, A., Loginova, A. , Martynov, F. and Janout, M. (2012) Distribution and potential impacts of coloured dissolved organic matter (CDOM) in the Laptev Sea (Siberian Arctic). [Poster] In: TOS/ASLO/AGU 2012 Ocean Sciences Meeting. , 19.02.-24.02.2012, Salt Lake City, USA . Kirillov, S., Dmitrenko, I., Hölemann, J. A. and Bloshkina, E. (2012) The oceanographic research in the Laptev Sea: an overview of major results obtained during the 5-years' journey with the "Laptev Sea System" project. [Poster] In: 10. Workshop on Russian-German Cooperation: Laptev Sea System. , 17.12.-20.12.2012, Kiel . Selyuzhenok, V., Krumpen, T. and Gerdes, R. (2012) Automatic landfast sea ice mapping using AMSR-E passive microwave imgagery. [Poster] In: ESA Conference on Earth Observation and Cryospheric Science, ESA-ESRIN. , 13.11.-16.11.2012, Frascati, Italy . Aagaard-Sørensen, S., Husum, K., Hald, M., Marchitto, T., Werner, K. and Spielhagen, R. (2011) Mg/Ca paleotemperature reconstruction of Atlantic Water advected to the European subarctic and arctic margins in the past 14.000 cal yr B.P.. [Poster] In: APEX Fifth International Conference and Workshop: Quaternary Glacial and Climate Extremes. , 01.06.-04.06. 2011, Longyearbyen, Svalbard, Norway . APEX Fifth International Conference and Workshop: Quaternary Glacial and Climate Extremes / hosted by The University Centre in Svalbard (UNIS). ; p. 98 . Adams, S., Willmes, S., Schröder, D. and Heinemann, G. (2011) Monitoring of thin ice in the Laptev Sea Polynya. [Poster] In: EGU General Assembly 2011. , 03.04.-08.04.2011, Vienna, Austria . Bauer, M., Schröder, D., Heinemann, G. and Willmes, S. (2011) Ice production of polynyas in the Laptev Sea calculated from mesoscale NWP model simulations for the winters 2007/08 and 2008/09. [Poster] In: EGU General Assembly 2011. , 03.04.-08.04.2011, Vienna, Austria . Ernsdorf, T., Heinemann, G. and Drüe, C. (2011) Airborne investigations of summertime katabatic winds and boundary layer structures over the NOW polynya near Greenland. [Poster] In: 11. European Meteorological Society Annual Meeting & 10. European Conference on Application of Meteorology. , 12.09.-16.09.2011, Berlin . Ernsdorf, T., Heinemann, G. and Drüe, C. (2011) Aircraft-based studies of katabatic winds and boundary layer structures over the NOW polynya near Greenland during summer. [Poster] In: EGU General Assembly 2011. , 03.04.-08.04.2011, Vienna, Austria . Greil, F., Janout, M. and Hölemann, J. (2011) Historical variability of the density stratification in the Laptev Sea. [Poster] In: EGU General Assembly 2011. , 03.04.-08.04.2011, Vienna, Austria . Janout, M., Hölemann, J. and Simmons, H. (2011) Baroclinic tides and their possible impact on bottom boundary layer evolution and vertical mixing in the Laptev Sea. [Poster] In: EGU General Assembly 2011. , 03.04.-08.04.2011, Vienna, Austria . Lenn, Y. D., Rippeth, T. P., Old, C. P., Bacon, S., Polyakov, I., Ivanov, V. and Hölemann, J. (2011) Intermittent intense turbulent mixing under ice in the Laptev Sea continental shelf. [Poster] In: EGU General Assembly 2011. , 03.04.-08.04.2011, Vienna, Austria . Preußer, A., Heinemann, G. and Drüe, C. (2011) Investigation of the dynamics of the North Water polynya for 1996-2010 using satellite data. [Poster] In: EGU General Assembly 2011. , 03.04.-08.04.2011, Vienna, Austria . Wegner, C., Reigstad, M., Forest, A., Forwick, M., Frey, K. E., Mathis, J., Michel, C., Nikolopoulos, A. and O'Regan, M. (2011) The Arctic in Rapid Transition (ART) Initiative: integrating priorities for Arctic marine science over the next decade. [Poster] In: Arctic Marine Geology and Geophysics Research School Seminar. , 15.03.2011, Tromsø, Norway . Wegner, C., Reigstad, M., Forest, A., Forwick, M., Frey, K. E., Mathis, J., Michel, C., Nikolopoulos, A. and O'Regan, M. (2011) The Arctic in Rapid Transition (ART) Initiative: integrating priorities for Arctic marine science over the next decade. [Poster] In: Cretaceous-Paleogene Palaeoenvironments, Tectonics and Biostratigraphy of the Arctic and Subarctic – A Workshop to Discuss Recent Advances and Future Directions. , 29.03.-30.03.2011, Tromsø, Norway . Wegner, C., Reigstad, M., Forest, A., Forwick, M., Frey, K. E., Mathis, J., Michel, C., Nikolopoulos, A. and O'Regan, M. (2011) The Arctic in Rapid Transition (ART) Initiative: integrating priorities for Arctic marine science over the next decade. [Poster] In: Engaging Early Career Scientists in Future Scientific Ocean Drilling. , 30.03.-01.04.2011, College Station, Texa, USA . Wegner, C., Reigstad, M., Forest, A., Forwick, M., Frey, K., Mathis, J. T., Michel, C., Nikolopulos, A. and O'Regan, M. (2011) The Arctic in Rapid Transition (ART) Initiative : integrating priorities for Arctic marine science over the next decade. [Poster] In: EGU General Assembly 2011. , 03.-08.04.2011, Vienna, Austria ; p. 4235 . Geophysical Research Abstracts, 13 (EGU2011-4235). Willmes, S., Adams, S., Schröder, D. and Heinemann, G. (2011) Spatio-temporal variability of polynya dynamics and ice production in the Laptev Sea between winters of 1979/80 and 2007/08. [Poster] In: EGU General Assembly 2011. , 03.04.-08.04.2011, Vienna, Austria . Adams, S., Willmes, S., Heinemann, G., Rozman, P., Timmermann, R. and Schröder, D. (2010) Verification of simulated sea-ice concentrations from sea-ice/ocean models using satellite data. [Poster] In: EGU General Assembly 2010. , 02.05.-07.05.2010, Vienna, Austria . Adams, S., Willmes, S., Heinemann, G., Rozman, P., Timmermann, R. and Schröder, D. (2010) Evaluation of simulated sea-ice concentrations from sea-ice(ocean models using satellite data and polynya classification methods. [Poster] In: Joint Russian-German Workshop on Research in the Laptev Sea Region. , 08.11.-11.11.2010, St. Petersburg, Russia . Adams, S., Willmes, S., Krumpen, T., Hoelemann, J. A. and Heinemann, G. (2010) Derivation of thin ice thickness retrieval within the Laptev Sea Polynya from high-resolution ice surface temperature. [Poster] In: Internatinal Symposium on Sea Ice in the Physical and Biogeochemical System. , 31.05.-04.06.2010, Tromsoe, Norway . Adams, S., Willmes, S., Krumpen, T., Hoelemann, J. A. and Heinemann, G. (2010) Thin ice thickness retrieval within the Laptev Sea Polynya from high-resolution ice surface temperature. [Poster] In: International Polar Year Oslo Science Conference, IPY-OSC. , 08.06.-12.06.2010, Oslo, Norway . Adams, S., Willmes, S., Krumpen, T., Hölemann, J. A. and Heinemann, G. (2010) Ableitung von Dünneisdicken in der Laptev See Polynja aus hochaufgelösten Eisoberflächentemperaturen. [Poster] In: 24. Internationale Polartagung. , 06.09.-10.09.2010, Obergurgl, Austria . Bauch, D. , Groeger, M., Dmitrenko, I., Hoelemann, J. A., Kirillov, S., Mackensen, A., Taldenkova, E. and Andersen, N. (2010) Atmospheric controlled freshwater release at the Laptev Sea continental margin : detailed investigation of distribution patterns. [Poster] In: Joint Russian-German Workshop on Research in the Laptev Sea Region. , 08.11.-11.11.2010, St. Petersburg, Russia . Ebner, L., Bauer, M. and Heinemann, G. (2010) Mesocyclone tracking in the southern polar region. [Poster] In: SCAR Open Science Conference. , 03.08.-06.08.2010, Buenos Aires, Argentina . Ebner, L., Bauer, M. and Heinemann, G. (2010) Mesozyklenverfolgung und Sensitivitätsstudien in der Antarktis. [Poster] In: 24. Internationale Polartagung. , 06.09.-10.09.2010, Obergurgl, Austria . Ernsdorf, T., Schröder, D., Heinemann, G., Adams, S. and Timmermann, R. (2010) Einfluss von atmophärischen Antriebsdaten auf Simulationen der Dynamik der Laptev-See_Polynjen mit dem Meereis-Ozean-Modell FESOM. [Poster] In: DACH 2010 Meteorologentagung. , 20.09.-24.09.2010, Bonn . Ernsdorf, T., Schröder, D., Heinemann, G., Adams, S., Helbig, A. and Timmermann, R. (2010) Simulation of Laptev Sea polynya dynamics using the FESOM model with different atmospheric forces. [Poster] In: EGU General Assembly 2010. , 02.05.-07.05.2010, Vienna, Austria . Ernsdorf, T., Schörder, D., Adams, S., Heinemann, G. and Timmermann, R. (2010) Simulation of Laptev Sea polynya dynamics using the FESOM model with different atmospheric forcings. [Poster] In: Joint Russian-German Workshop on Research in the Laptev Sea Region. , 08.11.-11.11.2010, St. Petersburg, Russia . Heinemann, G. and Radermacher, C. (2010) Tracking of synoptic weather systems in the Siberian Arctic and their impact on the Laptev Sea polynya. [Poster] In: EGU General Assembly 2010. , 02.05.-07.05.2010, Vienna, Austria . Ivanov, V., Polyakov, I., Ashik, I., Dmitrenko, I., Timokhov, L., Alexeev, V. and Kirillov, S. (2010) The structure of Atlantic Water at Eurasian continental slope in summer 2007. [Poster] In: EGU General Assembly 2010. , 02.05.-07.05.2010, Vienna, Austria . Kohnemann, S., Schröder, D., Heinemann, G. and Köberle, C. (2010) Abschätzung der Meereisproduktion in der Laptev-See mit dem Ozean-Meereismodell NAOSIM. [Poster] In: DACH 2010 Meteorologentagung. , 20.09.-24.09.2010, Bonn . Schröder, D., Heinemann, G. and Willmes, S. (2010) Implementation of a thermodynamic sea ice module in the NSP model COSMO and its impact on simulations for the Laptev Sea area in the Siberian Arctic. [Poster] In: EGU General Assembly 2010. , 02.05.-07.05.2010, Vienna, Austria . Schröder, D., Heinemann, G. and Willmes, S. (2010) Implementation of a thermodynamic sea ice module in the NSP model COSMO and its impact on simulations for the Laptev Sea area in the Siberian Arctic. [Poster] In: Joint Russian-German Workshop on Research in the Laptev Sea Region. , 08.11.-11.11.2010, St. Petersburg, Russia . Heinemann, G., Willmes, S., Ebner, L., Adams, S., Bauer, M. and Schröder, D. (UNSPECIFIED) How much sea ice is produced in the Laptev Sea of the Siberian Arctic?. [Poster] In: WCRP OSC Climate Research in Service to Society. , 24.10.-28.10.2011, Denver, Colo., USA . Wittbrodt, K. (2013) Sediment transport dynamics beneath and within the sea-ice on the Laptev-Sea shelf (Siberian Arctic). (Master thesis), Christian-Albrechts-Universität, Kiel, 72 pp. Wittbrodt, K. (2011) Sommerliche Schwebstoffkonzentration vor den arktischen Küsten Sibiriens am Beispiel der Laptev-See. (Bachelor thesis), Christian-Albrechts-Universität zu Kiel, Kiel, 57 pp. Krumpen, T. (2010) Investigation of ice formation and water mass modification in eastern Laptev Sea polynyas by means of satellites and models. (Doctoral thesis/PhD), Jacobs University Bremen, Bremen, X, 131 pp. DOI hdl:10013/epic.37102.d001. Klagge, T. and Novikhin, A., eds. and Shipboard Scientific Party (2011) Russian-German Cooperation Laptev Sea System : Frontal Zones and Polynya Systems in the Laptev Sea, The TRANSDRIFT XVII Expedition ; 31.08.2010 – 09.10.2010 ; Cruise Report. . , Kiel, 98 pp. Klagge, T. and Expeditionsteam TRANSDRIFT XVI (2009) TRANSDRIFT XVI - "Eurasische Schelfmeere im Umbruch - Ozeanische Fronten und Polynjasysteme in der Laptev-See" . . , 5 pp. Heinemann, G., Ernsdorf, T. and Drüe, C. (2011) Investigation of Katabatic winds and Polynyas during Summer - IKAPOS : field phase report. . Berichte zur Polar- und Meeresforschung, 633 . , Bremerhaven, 119 pp. DOI hdl:10013/epic.37929.d001. This list was generated on Thu Apr 25 04:08:44 2019 CEST.